If I had to choose one type of food to eat everyday for the rest of my life, the ol’ mighty dollar would have the final say. You see, my first choice would be sushi. But yeah…ka-ching! My second choice – a very close second, at that – would have to be soup. From creamy to broth, comforting to refreshing, soup can take on so many personalities. And unless you’re cooking nothing but lobster bisque or Kobe beef and barley, soup is as budget-friendly as any meal out there. This vegetable and whole wheat orzo kale soup came from a craving for something light but comforting in the midst of a season ruled by butter and sugar. Flavorful vegan soups have always been popular around here, including this potato and kale soup, my favorite vegan mushroom soup and this Instant Pot lentil soup. 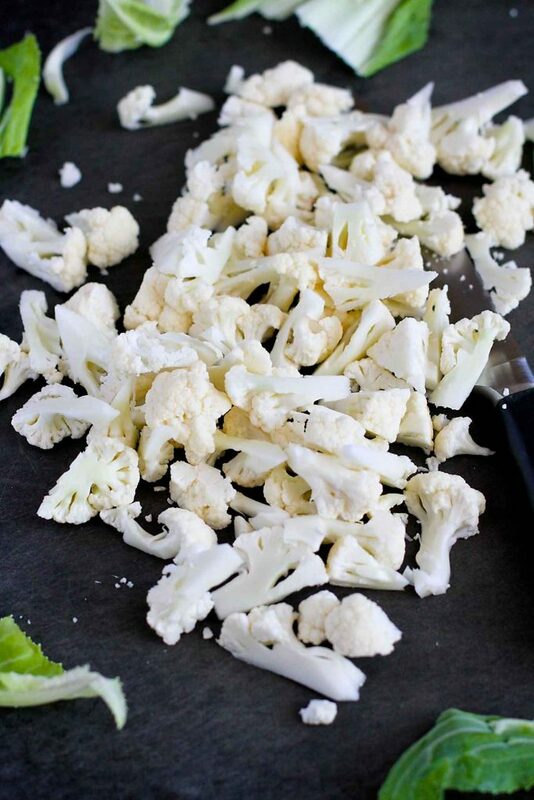 Ever since I starting grating and roasting cauliflower, I’ve fallen in love with this humble vegetable. Its neutral flavor and texture lends itself to a variety of flavor profiles and cooking methods. 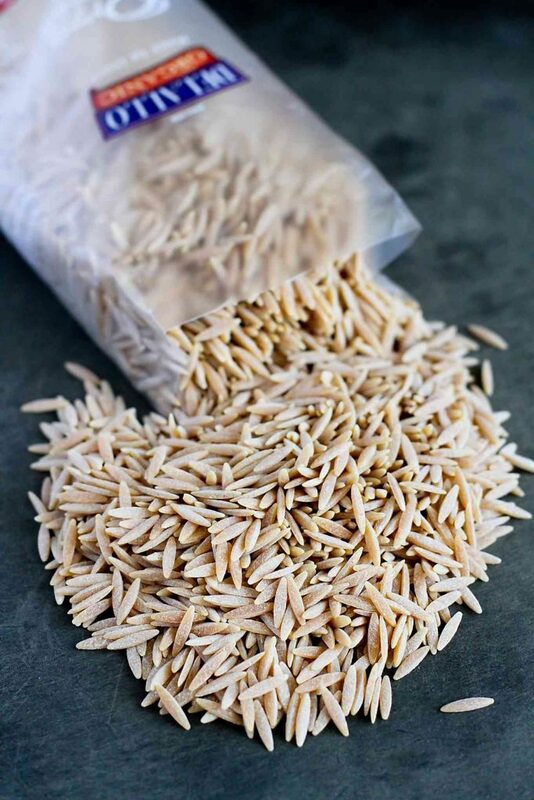 Whole wheat orzo used to be really hard to find, but thanks to a few forward-thinking brands (this whole wheat orzo is my favorite), it can be found in many grocery stores, including Whole Foods. 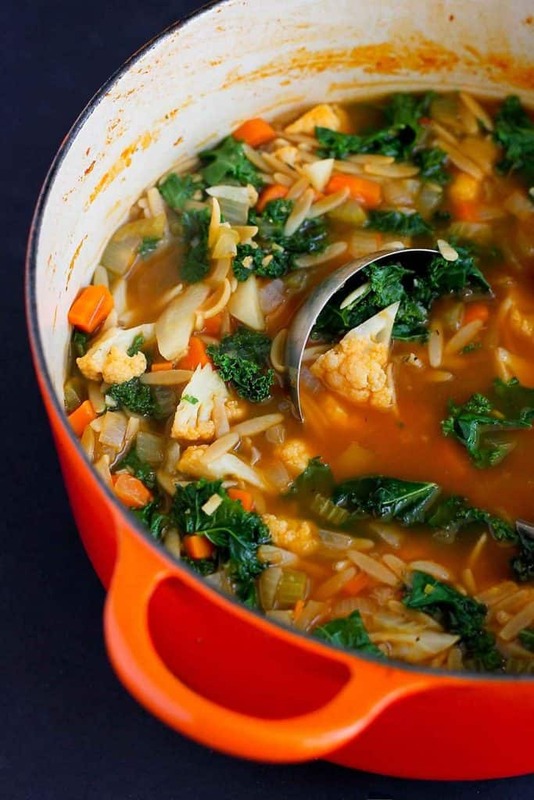 Between the cauliflower, whole wheat orzo and kale, this soup is a powerhouse of fiber. Just one serving has 9.1 grams. The recommendation daily intake of fiber is 25 grams and 38 grams for women and men, respectively. That’s one great reason to work this soup into your weekly menu! Heat the olive oil in a large saucepan set over medium heat. Add the onion, carrot and celery, and cook until the vegetables are beginning to soften, about 5 minutes. Stir in the garlic, thyme, rosemary, red pepper flakes, salt and pepper, and cook for 1 minute. Stir in the tomato paste and cook for 1 minute. Add the cauliflower florets and vegetable broth, and bring to a boil over medium-high heat. Reduce to a simmer and cook for 5 minutes. Increase the heat to medium-high and stir in the orzo. Cook until the pasta is almost al dente. Stir in the kale and cook until just wilted, about 1 minute. Serve. *Not included in nutritional info. The post was originally published on December 9th, 2014. Portions of the photos and the text have been updated. Oh Dara, I could eat sushi every.single.day *high five* But, alas, too expensive like you said. Thank goodness for cauliflower. Love this soup! I love hearty kale in soup and rarely put in cauliflower, great idea! I’m with you, I love soup in its many varieties and forms. This sounds so healthy, and incredibly delicious! Two of my faves are cauliflower and kale. I’m loving this healthy, flavorful soup! What a great soup – so full of healthy ingredients and gorgeous to look at too! I need this healthy soup after the way I’ve been eating lately!! Looks scrumptious! I could eat this every day! Plus- it could be a great make ahead lunch for me. A cup of soup loaded with veggies is a great ‘stuck behind the computer’ lunch! I enjoy soup all year round, too, Dara. The possibilities are endless! This one looks perfect for a day like today when it’s just too chilly to be outside for long! 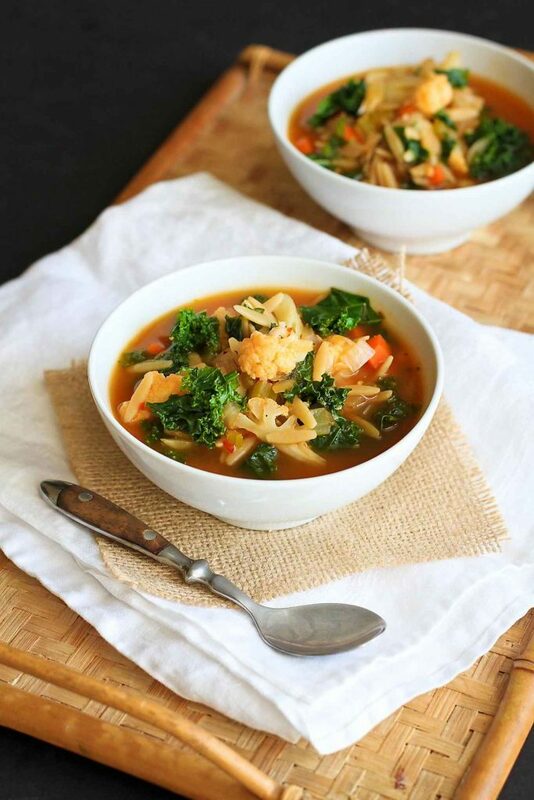 My hubby is on a kale kick right now and I think he’ll totally dig this soup! 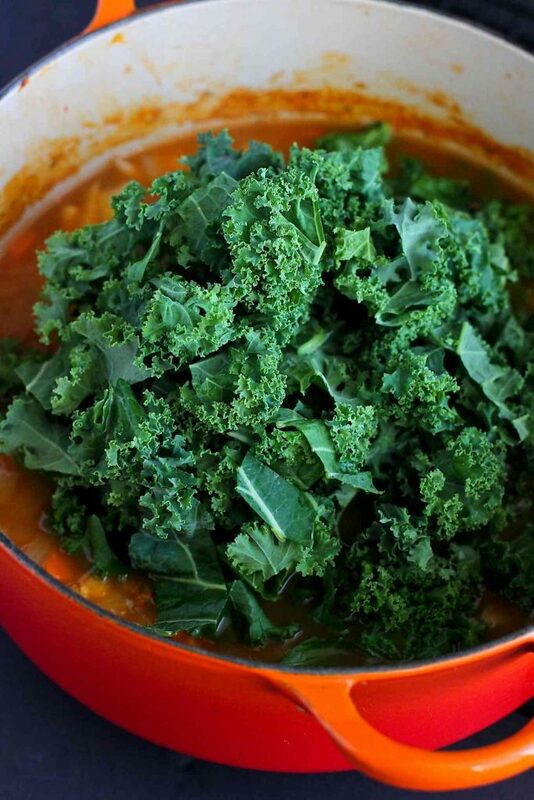 I am a kale fanactic, so this right up my alley and perfect for cold winter days! I need to get more greens into my diet. This looks like a good way to do it. I adore soup! This looks so amazing. I just want to dive right in there and have a giant bowl of this beautiful soup. I would likely pick pasta if I could only eat one thing for the rest of my life. I’m such a carb girl. Not sure why but pasta is my go to meal. Wow…I would love a bowl of this right now! So full of everything I love. I agree, Sushi is number one! But this soup sounds fantastic as well. This soup sounds delicious. Thank you Dara. This is one of the BEST soups I have ever made. Plus, it’s crazy easy to make and doesn’t break the bank. I just hope it packs well for lunches! I love the combination of flavors and textures in this soup! Orzo is the perfect compliment. I love cauliflower, glad to see it in this soup! Sounds delicious. Love soups like this! So filling but full of flavor! Soup is one of my very favorite things to cook, too! I love the cauliflower and kale in this recipe – delicious!